Last week, we had the privilege of attending and participating at the Expert Series Fall ETP Forum put on by ETF Global. John Jacobs, an ETF Godfather, kicked off the event with a spot on overview. He struck a chord with us on two topics. Here is the second point that resonated – Keeping the investors first. Those who are looking to help advisers and investors manage the real risk to investment success will thrive. Developing strategies for the sole purpose of delivering needed exposure that provides value for the end user is what’s needed…not a cool story. True value is the thing that facilitates longevity for anybody in the asset management business. No strategy works all the time, but evidenced based strategies and ETF issuers focused on the communication and education demanded by advisers and their clients have an opportunity in front of them. 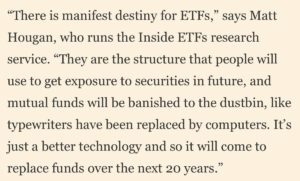 There are many unknowns, but the one thing that I’m confident in saying out loud is that there is big opportunity in the ETF industry. Opportunity attracts innovation and this innovation will benefit investors. There are a few potential red flags – ETFs were designed for transparency and efficiency – more and more firms are trying to bring their “black box” to the ETF world. Probably not a great thing for the end user but they have the capital to push forward…we will see how it unfolds. Either way, the road forward for high fee active management will be a difficult one. 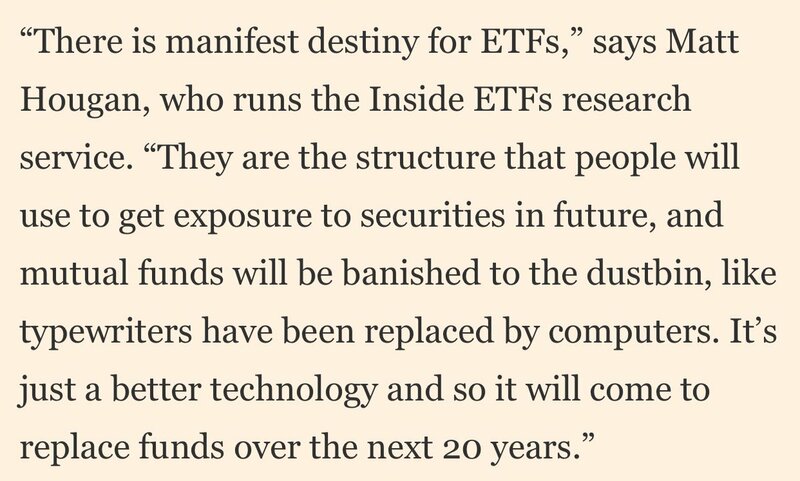 The wind in the sails of the ETF industry is just beginning to blow.